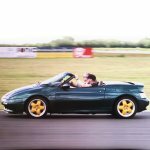 Lotus Elan Central • View topic - S2 Database 360 / 802 listed . S2 Database 360 / 802 listed . Post here if your topic fits no other thread in this category. Re: S2 Database 360 / 802 listed . Sold for 4G two weeks ago at salvage auction that did, I watched it go through. I'm sure that this car was salvage two / three years ago and was up for £3k. I might be wrong and stand to be corrected. tb10 wrote: I'm sure that this car was salvage two / three years ago and was up for £3k. I might be wrong and stand to be corrected. Another 5 alive to the database . Does this look like 362 on the dash ? 302 or 362 I reckon. The other one, 522, registered 24/3/1997 claims that there were only 300 S2’s made in LHD. Do we know if that’s right? John_W wrote: 302 or 362 I reckon. not sure of those figures ? but here we have it as NMY LHD ..
It’s Calypso red with black interior and black hood, 52kms, and is number 131. 1st registered in Sydney Australia in 1994. Where do I get a link to the current register? Hey David from down under. Is this one on the database? No. 524. Quite a close relation to mine. Number plate has SGT the supplying dealer of mine on it too. You should have #644 in the DB listed to me...I'm sure it was in the DB, but let me know if not. What colour is 780? Too dark to be Pacific blue but doesn’t look Azure either. It’s very nice. Anyway, I like it very much too! Looks like Azure Blue to me.